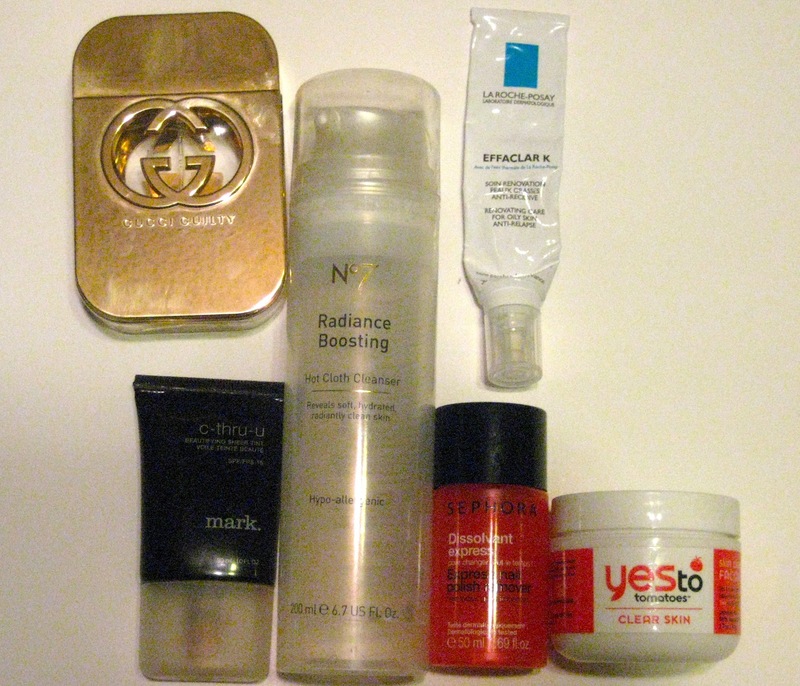 One of my favorite blog posts to read are monthly empties. It's interesting to see what's good, bad and so-so. I like posting because it will remind to not buy again, or maybe keep buying! It also makes me control my stash and therefore not feel guilty buying when I see that I actually do use stuff up! No7 Radiance Boosting Hot Cloth Cleanser: I've been using this since December and adore it, feels like buttah and makes my skin soft. I usually use my Clarisonic in the shower, but on nights where I needed to wash my face, this was my go-to. Will repurchase asap! La Roche-Posay Effaclar K: This was something I saw on a lot of blogs and had very good reviews, with good reason! This helped get rid of my cystic acne that had been flaring up on my skin since last summer. Quite pricey, but if I see it for a good price, will def repurchase! Mark c-thru-u Beautifying Sheer Tint: This stuff was amazing!! I've had this for way too long, but as with my Murad Bronzer-I liked to add a smudge with my foundation for a glowy look! Sadly this is no longer on the site and I think has been discontinued. Yes to Tomatoes Clear Skin Skin Clearing Mask: I got this in a christmas gift basket. It was extremely thick and hard to apply! I didn't feel much after washing it off, except some slight irritation. Will not be repurchasing. Sephora Express Nail Polish Remover: This stuff is awesome and works like a charm!! It was a bit pricey-about $5 for a 50 ml bottle, but def worth it. I only had to go once around the block (nail) to remove most polishes! Will repurchase once I finish my Target brand of Acetone polish remover. Philosphy Have a Cherry Christmas Shampoo, Shower Gel & Bubble Bath: Love the scent of cherries. got this for christmas last year and love it. Even though it's a 3-in-1, for the price, I don't think I'd repurchase unless there was a deal or huge sale. Rusk Deep Shine Oil Moisturizing Shampoo: I won this (and the conditioner-still have a bit left of that) on the Lucky Magazine website. This made my hair crazy soft and smelled lovely. I also have the hairspray with moroccan oil, and it's perfect for spraying down flyways and again, love the smell. Will repurchase if I can find it on sale. Aussie Split End Protector: I love Aussie products. I usually added a bit of this with some leave-in conditioner or a some hair serum and quite liked it! 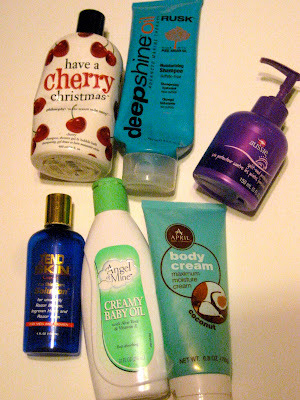 I have tons of hair products but will maybe buy this again when I finish more products in the future. Tend Skin Liquid: Good, but not great for Ingrown Hairs. Have already repurchased. April Body Cream Coconut & Angel of Mine Creamy Baby Oil: I got both of these at the .99cent store and love them!! I have dry skin and have to apply moisturizer immediately after showering. These two smell divine and make my skin baby soft (Especially the Baby oil;) For the price I cannot say no-I have repurchased many times and have several backups of each! Thank you! I'm a bargain hunter and a product lover - always looking for great stuff that won't be too hard in my wallet! I'm now intrigued by the No.7 cleanser and I love Effaclar Duo though now I want to also try the K. Do you know what the difference is? thanks Liz-I'm always inspired by your empties posts! The No7 Cleanser is amazing!! the LRP Effaclar K was def not a quick fix but after a bit I did notice a difference. I've header about Epiduo, I was on Clindamycin Topical (my cystic acne was pretty severe) and between the LRP K and Duo, they helped it a lot! I love reading Empty posts-would love to read your monthly ones! Thanks Claire! Yep, I have to agree i can see the No7 becoming a staple in my cleaning regime. I've even got my mom using it! I love the Gucci but as I mentioned it has no lasting scent on me. I've been usage my mom's Chloe EDP...Love that scent! !